The United States House of Representatives will vote at approximately 6:30PM EST to designate the Islamic State’s violence against Christians and other ethnic and religious minorities as genocide. Congressman Jeff Fortenberry (R-NE) introduced H. Con. Res. 75 in September. The resolution, which was announced at In Defense of Christians’ (IDC) National Leadership Convention on September 10, passed the House Foreign Affairs Committee last week with unanimous support. It is expected to pass the full House with overwhelming bipartisan support today. 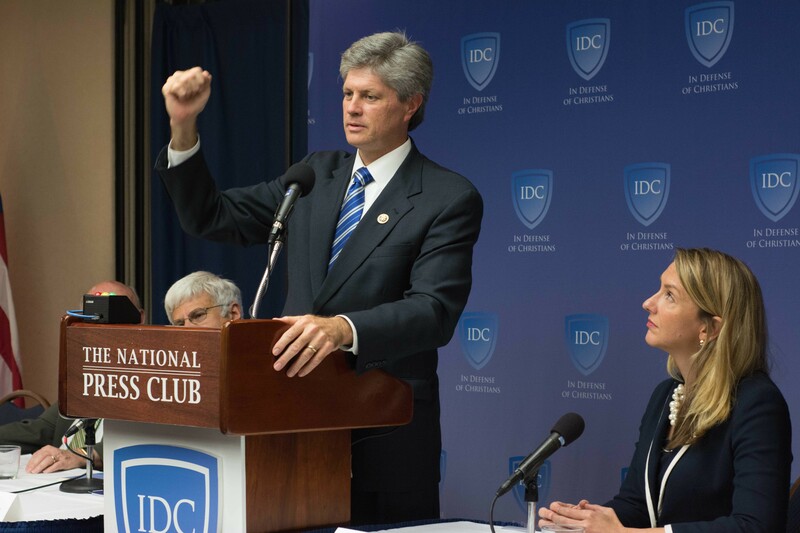 Over the last six months, IDC, in close collaboration with Congressman Fortenberry, Congresswoman Anna Eshoo (D-CA), religious scholars, activists and academics, has worked to bring public and political attention to the plight of persecuted, enslaved and murdered Christians and other minorities in the territories under ISIS control and to press lawmakers to support H. Con. Res. 75. At present, there are over 200 co-signers. Today’s vote is a precursor to a congressionally-mandated deadline for the State Department to make a determination as to whether the persecution of Christians and other religious minorities in the Middle East will be designated genocide. State is required by law to do so by this Thursday, 17 March. Last Thursday, IDC, in collaboration with the Knights of Columbus, released an extensive report, compiled at the behest of the State Department, chronicling the genocide of Christians and Yazidis in territories controlled by ISIS and its affiliates in Syria, Libya and Yemen. The nearly 300-page report, “Genocide against Christians in the Middle East”, was distributed to House members in advance of today’s vote. Submitted to Secretary of State John Kerry on March 9th, the report was compiled from evidence of a recent fact finding mission to Iraq, which documented the murder, injury, enslavement and displacement that Christians have suffered at the hands of ISIS. To date, the European Parliament, the International Association of Genocide Scholars, the United States Commission on International Religious Freedom, Pope Francis, and presidential candidates in both parties, among many others, are standing in solidarity to name and decry this genocide. IDC President Toufic Baaklini, Executive Director Kirsten Evans, Director of Government Relations Kristina Olney, and Director of Media and Communications Ninar Keyrouz are available for comment on the resolution and the on-going genocide of Christians in the Middle East. Media inquiries can be sent to press(at)indefenseofchristians(dot)org, or call our media desk at (202) 624-7898.